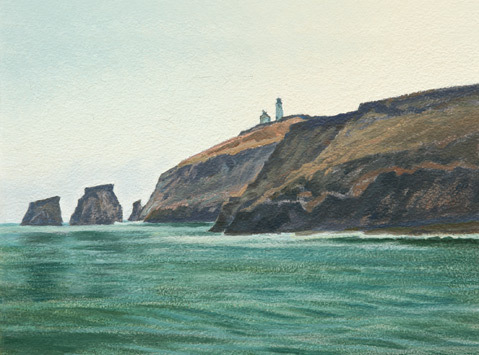 “View of Anacapa.” Painting by Ray Strong. Thanks to recent, nearly simultaneous releases of an exhaustive yet engaging history book and a detailed plan for the decades to come, the past realities and future likelihoods of the Channel Islands off the Santa Barbara coast have never been so clear. This week, we shine a light on both efforts. First, we interview author Frederic Caire Chiles and publish passages from his new book, California’s Channel Islands: A History. Then alongside each island-by-island excerpt, we explain how the National Park Service hopes to make the Channel Islands National Park more user-friendly while continuing to protect valuable natural resources. Those goals were published last month in a 550-page plan that, if finalized in the coming months, will require $62 million in funding plus $14 million a year in operational costs. For more info, visit nps.gov/chis. On top of that, we’re using this week’s spotlight on the Channel Islands to celebrate legendary artist Ray Strong, whose painting of Anacapa Island adorns the cover of this week’s paper. He is the subject of exhibits at the Santa Barbara Museum of Art, Santa Barbara Maritime Museum, the Santa Barbara Trust for Historic Preservation, Santa Barbara City Hall, and Santa Barbara Historical Museum this year. In addition, Sullivan Goss is raising money to fund a major art book and online compendium of Strong’s work. See theraystrongproject.com. Uncovering the Channel Islands’ Unique Histories – Excerpts from enlightening book, plus interview with author and Santa Cruz Island descendant Frederic Caire Chiles. National Park Service’s Channel Islands Plans – A rundown of what’s to come for each island in the park’s archipelago.